The Cornish peninsula is something of a natural wonder, and we’re often asked about the county’s best scenic drives. From day trips around the coast to rural ramblings, we’re spoilt for choice when it comes to exploring Cornwall by car. After much deliberation, we’ve decided on our three favourite excursions. There may be a few winding lanes along the way, but we promise it’s all worth it for the beautiful views. The Roseland is wonderfully unspoilt, and with beaches on three sides of the peninsula, this is a perfect drive for those who want to enjoy a mix of coast and countryside. There’s plenty of surrounding villages to stop in, but we’d recommend visiting Mevagissey, a lovely harbour town which has a rich fishing history. Otherwise, take a trip to St Mawes by following the A3078 from Tregony, and which passes Portloe, Veryan and Carne. The fish and chips at The Watch House are particularly delicious. If you’d like to continue on your journey from St Mawes, and are happy to ditch wheels for water, you can travel across to Falmouth on the foot-passenger ferry. Tucked away in South East Cornwall, Whitsand Bay is characterised by long stretches of golden sand which run from Rame Head to Portwrinkle, moving east to west. It’s considered to be one of Cornwall’s hidden gems, but we think it’s too good to keep to ourselves. Whitsand Bay Beach has a constant swell, so if you wanted to take some time out from behind the wheel, it’s the perfect opportunity to take a dip in the surf. From the beach, you can move on through Freathy and Craftholem and you will eventually arrive in Looe. There’s lovely old charm to enjoy here, and Polperro is just a stone’s throw away. The Old Sail Loft Restaurant is one of Looe’s oldest buildings and serves fantastic seafood. It is well worth a visit for lunch or supper. This trip can be longer or shorter, depending on how much time you have. If you’re starting from The Old Quay House, head towards Bodmin and join the A30 westbound, or for a slower route west, take the A390 to Truro, and head at a more leisurely pace towards West Cornwall, on the A39 and A394 via Helston and Porthleven. 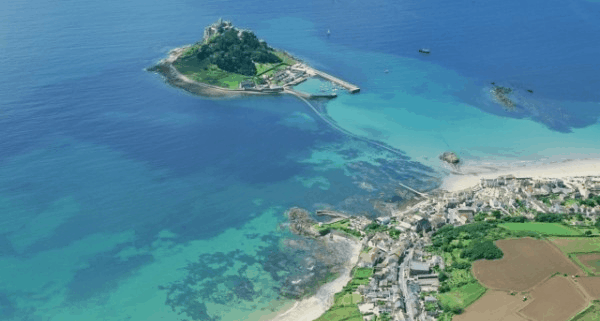 The journey is well signposted along the way, and gives you the opportunity for numerous pit stops, as you pass St Ives, the Minack Theatre near Porthcurno, fishing villages including Newlyn and Mousehole, and the famous St Michael’s Mount. Our favourite stretch of the journey is from St Ives to Sennen Cove, taking in Zennor and Cape Cornwall along the way. You have sea views and the route really celebrates the diverse landscape Cornwall is so well known for. Don’t forget, if you’re planning a scenic drive during your stay with us, we can help plan your route and prepare a delicious picnic for your trip.